Newton Barrow, Nr Stoford, Wiltshire. Reported 15th June. 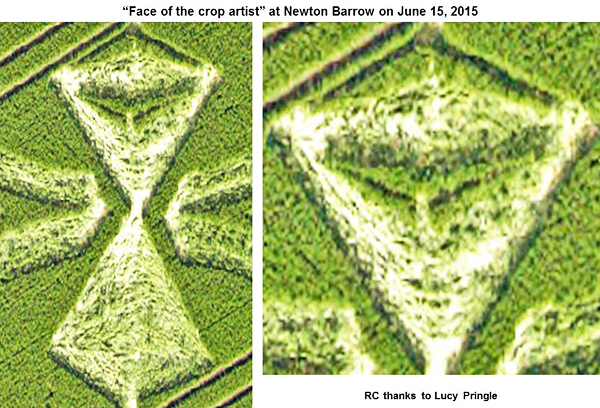 This crop circle was reported on June 15, 2015 at Newton Barrow, Stoford, Wiltshire, UK. 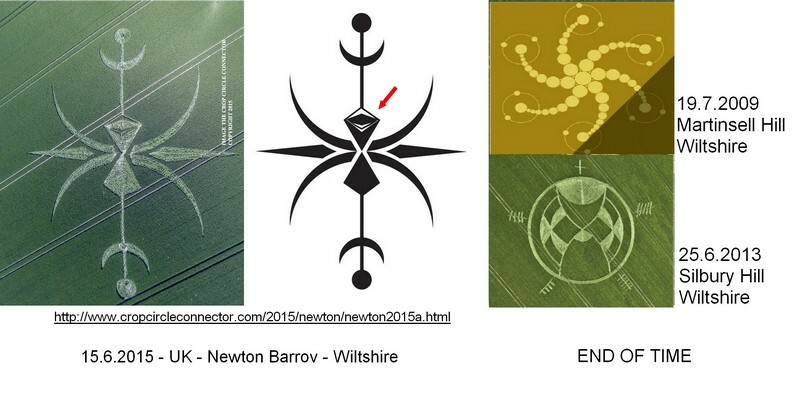 Apparently, the place for this crop circle (Newton Barrow) was chosen not by chance. One of the meanings of the word “barrow" is: “ancient burial place”. 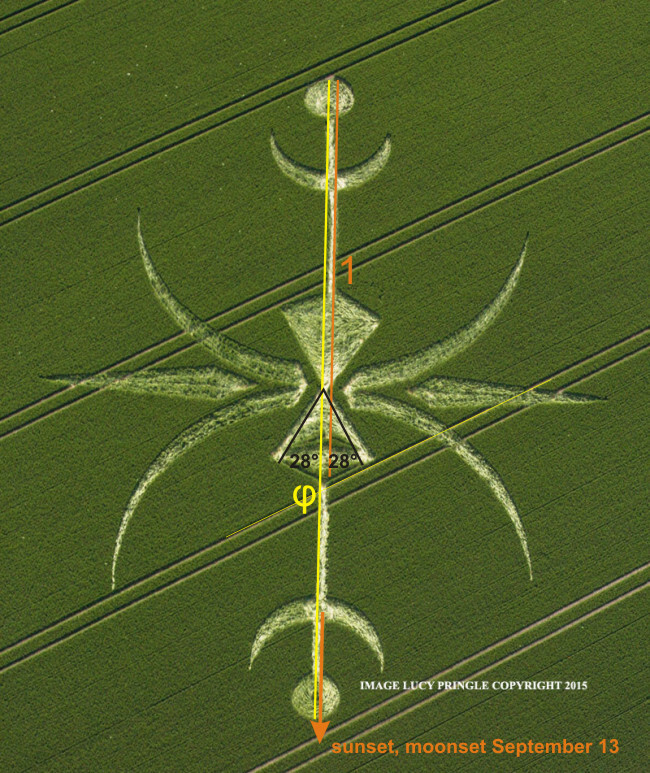 The crop circle makers appeal us to stop wars and fighting. They deliberately have chosen these medieval arms. On this way they obviously want to say us, that we behave us like people from the Middle Ages. With the sand clock they want to tell us, that the time for such methods for resolving of conflicts is up. According to the Mayan calendar Tzolkin, now we are in the White Castle, which began on May 26 and continues till July 16, 2015. 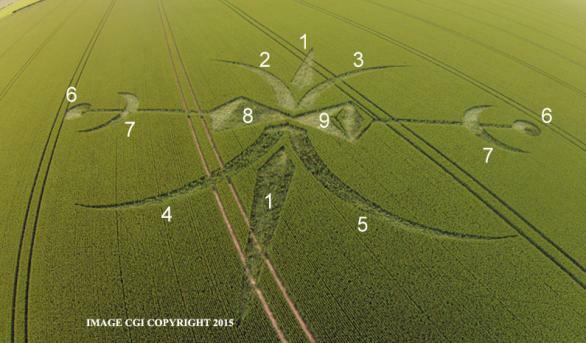 This crop circle continues the theme about the White Castle, the Yellow Warrior, the White Worldbridger etc., which was subject in previous crop circles. submitted Brian L. Crissey Ph.D.
At the request of the circlemakers, this formation led to a powerful composite cosmic energy essence in combination with the Milk Hill energies from 2001. This composite essence, Beneficence, [http://notmadebyhands.com/2014.html#1433] is a conflict-resolution tool, intended to help divided nations find peace. Petra Maia: We are getting unrequested information now constantly. We are fully connected here. It is about two separated worlds. There is a clear line between them, a border or a oin energetically. The worlds are not able to merge and even more in contrary direction. Two shields and two swords pointing at each other hint at a still on-going separation. Only if we remove the pin can the worlds/dimensions get closer. An expiring time frame is signaled by the sand clock, which however also is twisted somehow. I feel a relation to Einstein’s theory of time-space continuum. Also if we remove the pin it remains two options, perhaps fight or peace, finally. After awakening, I got contact with other beings who are located behind our sun in our solar system. They showed me the next circle, too, a kind of dodecahedron in a web, or a grid-like sunflower. ● Sean Solloway: Circle makers are from Aldebaran. It feels like a partition between light and dark. It is time to balance and integrate light so a symbiosis could be possible through grace of light. Still two possibilities each and every sand corn that drops is a decision in making of a new world. The 2 halves must come together to integrate into the light. Why is the position near these two cell phone towers? It shows we must change our patterns of behavior and thinking. The pattern is just a symbol of the situation. It does not have interference or involvement with the tower. It is just a symbol of humankind’s awakening process. I think the crop circle Newton Barrow visualized the hourglass, which are already full, and then there is a link to an eclipse. The closest solar and lunar eclipses will occur in the month of September 2015. ??? To me the Newton Barrow formation looks like the Zen Koan of 2 arrows hitting in mid air. The Koan has different interpretations, but all of them good. Maybe it's the Newton Arrow formation. On the day of the formation, there was a small waning crescent moon, one day before new moon. This is in line with the formation, which shows 2 large and 2 small crescent moons. Four lunar months later falls one day before the new moon of October 13 (i.e. October 12), while four Gregorian months later is October 15. Does this formation refer to these dates (October 12 and 15) and why? On October 15, 1582, Pope Gregory XIII introduced the Gregorian calendar. Could this be the clue of the formation? Let us do some more research! The Gregorian calendar is a calendar reform of the Julian calendar, which Julius Caesar introduced in -44 (45 BC). The Julian calendar started on January 1, -44 (45 BC). Do to the triennial cycle (each third year was a leap-year; August corrected this) that was introduced at that time, this was December 31, -45 according to the proleptic Julian calendar (according to the so-called Bennett solution). Astrolog reveals that the lunar phase on this date was identical in comparison with the date of the formation (one day before new moon). Moreover, it turns out that on the day of the formation the introduction of the Julian calendar happened exact 199 × 128 lunar months ago. The fact that 128 = 2^7 (4 × 4 × 4 × 2) is remarkable and fully in line with the formation! The official introduction of the Julian calendar was preceded by the so-called “last year of confusion”, an extra long year (445 days), that Julius Caesar introduced, in order to align the Roman calendar with the tropical year again. The last year of confusion started on October 12, -46 (47 BC) in the proleptic Julian calendar. Thus, here we find the exact connection of the formation (pointing to October 12, 2015) with the introduction of the Julian calendar. Nevertheless, there is another remarkable fact that cannot be ignored. The start of the last year of confusion was approximately 15 lunar months before the official introduction of the Julian calendar. When we count an additional month (29 days) back to the past, this is September 13, -46 (proleptic Julian; 1 December Roman calendar), we find a connection with the formation again, as this falls 144 × 3 × 59 (a multiple of 4 × 4) lunar months before the date of the formation. Moreover, we find the very remarkable fact that the relative position of the sun, the moon, Mars, Venus and Jupiter were all approximately the same in comparison with June 15, 2015, the formation creation date! Mars was in a very close conjunction with the sun on both dates. Venus and Jupiter were in a (wide) conjunction on both dates and on both dates visible in the evening, while Venus reached her maximum elongation on both dates. On both dates, it was one or two days before new moon. The formation also displays the maximum elongation of Mercury (approximately 28 degrees). The reason is that apart from the moon also Mercury has been related to the past in connection with the number 2 (raised to the power of 5, which is 32). The orientation of the formation is towards sunset and moonset on the day of the partial eclipse of September 13, 2015. Note that sunset and moonset symbolize an end. Counting 6496 (a multiple of 32) synodic cycles of Mercury on that date to the past brings us around the start of the last year of confusion on October 12, -46 and counting 2061 years back brings us to the earlier mentioned date September 13, -46. The formation refers to October 12 and 15, 2015. October 15 is related to the introduction of the Gregorian calendar on October 15, 1582. October 12 refers to the official introduction of the Julian calendar, 199 × 128 (= 2^7) lunar months ago, as well as the start of the preceding year of confusion on October 12, -44. It is also related to the date one month earlier, a date that was characterized by very similar positions of celestial bodies (sun, moon, Mars, Venus and Jupiter) in comparison with the date of the formation and also a multiple of 4 × 4 = 16 lunar months in the past. Regarding Mercury, about 7 × 29 × 2 × 4 × 4 synodical cycles have passed by (in September). This number (containing 2 and 4) also is related to the formation. In contrast to what people often believe, in my opinion the Julian and its successor the Gregorian calendar are no “artificial” calendars, but have a relationship with creative forces of the divine order. This means amongst others, that they have a predestined begin-date and end-date. Although nowadays the Gregorian calendar replaced the Julian calendar for “daily use” all over the world, this is not the case regarding religious festivals. For example in Eastern Europe Christmas, Eastern, Pentecost etcetera are still observed on dates that are in accordance with the Julian calendar; thus Christmas is on December 25 of the Julian calendar, but this is January 7 in the Gregorian calendar, a difference of 13 days. This means that October 13, 2015, new moon, (which is between October 12 and 15 to which the formation refers) is September 30, the last day of the month in the Julian calendar. In my vision, the calendar is only “valid” because the very start of the calendar as well as the very end of the calendar is bound to be on or around new moon. September 2015, in the Julian calendar, but ending on October 13 in the Gregorian calendar is the last month for the upcoming 3 years that this condition is met. 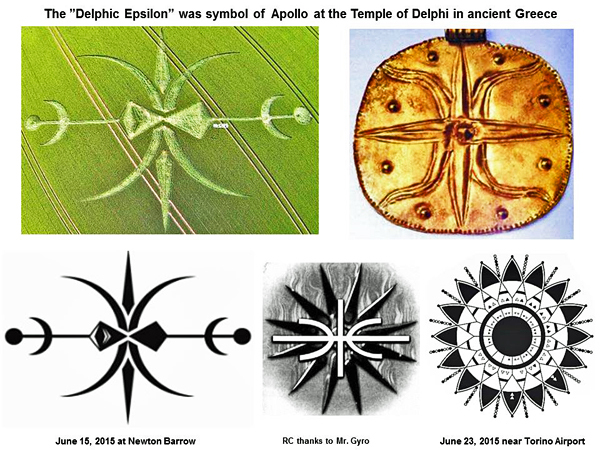 There are quite some indications (several other crop circles amongst others) that the creative force of the Gregorian calendar ends on February 28, 2017, which means that any date after February 28, 2017 is artificial indeed. Note that March 1 is the traditional beginning of the (religious) year, making February the terminating shorter month of the year. February 28, 2017 falls two days after an annular eclipse (new moon) on February 26. - The maximum of the annular eclipse occurs at almost precise 15:00 universal time! - The solar eclipse will last approximately 3 hours (from the very beginning to the very end on the same location as well as the duration of the eclipse path). - Jesus resurrection occurred “on the third day”, which is two days later. The “third day”, two days after February 26, is February 28, the last day of the Gregorian calendar! Note furthermore that February 28, 2017 will fall 624 days after the formation creation date. This is 13 × 3 × 16 days; hence, there is a relationship with 4 × 4 = 16 again. The formation also clearly displays a cross. The formation can also be explained as the connection between the partial solar eclipse on September 13, 2015 (actually just before the start of the last Julian month September) and the annular eclipse on February 26, 2017, which will occur 18 lunar months later. If it is true that the formation refers to the “death” of the Gregorian calendar from a creative point of view, the formation refers to the creation that is related to that, which is the symbolic death and resurrection of the human race. It refers to a transformation process that humanity will make through in order to survive and in order to be able to live in harmony with each other and planet Earth. Note that a similar formation was found on June 24; this formation might be explained in a similar way. Luxenborough, nr West Amesbury, Wiltshire. Reported 24th June. I want to report my idea which is about this CC and a pyramid. I have had an idea that if I see a pyramid in Egypt from somewhere underground, I should see an arrow like diagram. And such a diagram seen from a point concerning 18 degree is very similar to this formation.